After the previous update was not well received by Windows' desktop users, Skype resorted to test several other designs and outlooks of the application. Today, it is launching its latest version for Windows. This time, the feel of the application would hopefully be more similar across all devices, may it be mobile phones or desktops. 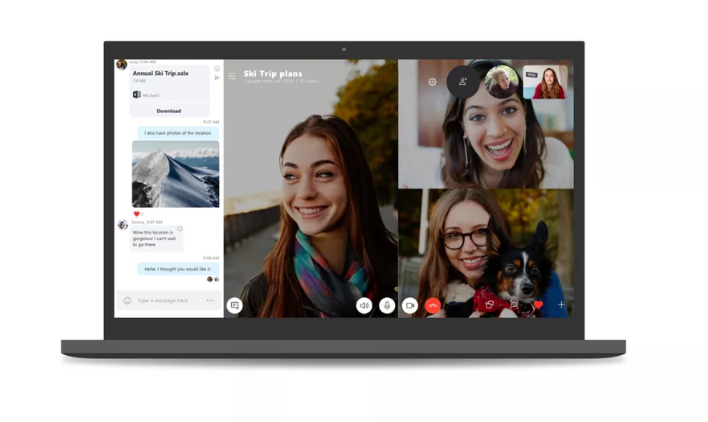 Skype will be borrowing many features from the Windows 10 and the mobile versions of the same application. The company has improved the group chat feature by making adjustments which facilitate the sharing of images during a Skype conversation. Moreover, it has included @ mentions, message reactions, notification panel features, and gallery to search shared photos/links/documents as parts of the new update. For the upcoming versions, it is projected that the application might go with read receipts in private conversations. Also, the company would possibly work on the end-to-end encryption of video calls and messages, and also provide the facility of recording calls, so that users do not have to rely on external tools for this need. The company is hopeful that it would now be able to register itself with the public more positively this time. Skype will force users to install the latest version by September 2018.